Download Android Instant Apps: The Google has recently announced that its Android Instant Apps now has crossed 500 million Android users. The Instant Apps service by the online search giant allows users to run apps on their mobile devices “instantly” by just tapping a link, With this app, people don’t have to install the apps first.Google had first showcased the Instant Apps at the Google developers’ conference Google I/O in 2016. Android Instant Apps is open for all developers and it is supported on all the latest devices, which run on the Android versions ranging from Android 6.0 to Android O. This app can be accessed in more than 40 countries. Instant Apps has the same Android APIs, project, and source code as the existing Android App. 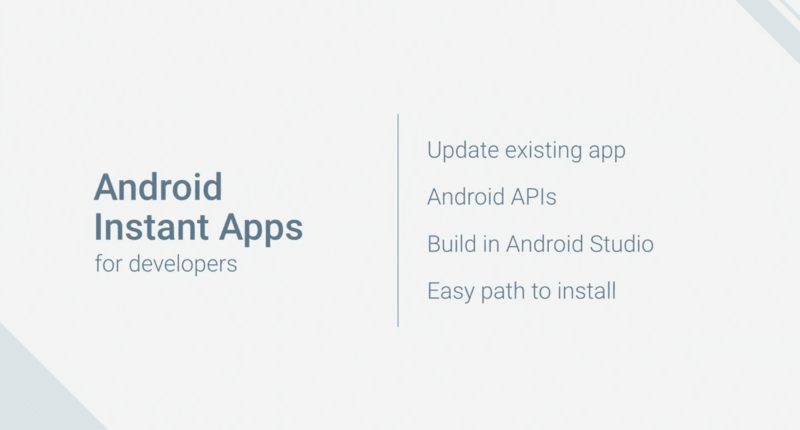 To make an Instant App, developers will need to install the Android Studio 3.0 and the Instant Apps development SDK. The Following the creation and publication of the Instant App, users can access it on their Android devices via any URL, such as social media, search or even messaging. However, the app executed in the smartphone has a limited functionality. The Users can choose to download the full app if they want.